I first heard about Three Strong Women the beginning of 2013. When I was given a review copy by Quercus mid last year I was really excited. Unfortunately, I was not able to read the book until a month ago - so this review is coming in much later than I ever anticipated. Better late than never I say ... and thank you Quercus for the review copy. Born in France to a French mother and Senegalese father, French novelist and playwright Marie NDiaye published her first novel Quant au Riche Avenir (Regarding the Rich Future) at 18. Her most recent novel, Troise Femmes Puissantes, published in 2009 and translated into English as Three Strong Women in 2012, won France's most respected literary prize - the Prix Goncourt in 2009. She was also a finalist for the 2013 Man Booker International Prize. 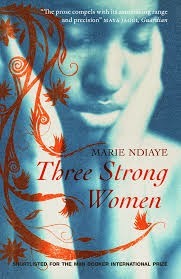 Three Strong Women is a three part novel set between France and Senegal and told from the perspective of its three main characters. In Part 1, we meet Norah - a bi-racial French-Senegalese lawyer in her 30s returning to Dakar, Senegal at the request of her elderly father. A wealthy businessman, once immaculately dressed and groomed, he is now aged, overweight and unkempt. From the get-go there is a sense that Norah doesn't really like her father and over the course of her story we find out why. For starters he never found Norah and her sister attractive. More than that, he left his two daughters and their working-class mother in France when they were younger to return to Senegal with his only son, Sony (Norah's younger brother). This one act ruined the family - he may have let his daughters visit their brother a few times, but he did not let his wife visit for the longest time. When he eventually did, the relationship was strained and awkward. Also, while Sony was spoilt and pampered, Norah, her sister and mother struggled to survive in France. Which begs the question, why then has he asked Norah to come to Senegal? In Part 2, we meet Rudy - a Frenchman married to a Senegalese woman, Fanta. This part happens over the course of the day and we go in and out of Rudy's thoughts learning a bit about Fanta - the strong woman in this tale. Rudy has returned to France after being sacked from his job in Senegal after an incident at the school he worked. He made Fanta and his son, Djibril, move to France with him - even though he was aware Fanta would be unable to get a job in France. While Rudy thinks she is having an affair with his boss, we get a sense of Fanta's frustration and boredom in France. Part 3, tells the story of Khady. Khady is Fanta's cousin, but we also meet her briefly in Part 1 in Norah's father's house as a worker caring for her father's children. We meet Khady a few years later as a young widow whose husband's family decide to send her to France to her cousin Fanta. This story focuses on her not so smooth journey to France. I'll be honest, the title threw me off a bit - especially after reading Norah's story. I was expecting all stories to be told from a female perspective ... and well, one part is told by a man. So I was reading Rudy's part waiting in anticipation to hear Fanta's voice, her side of the story. Instead I got Rudy's endless stream of consciousness. This made me wonder, what was she going through? As an immigrant in France, unemployed, frustrated, bored. And did she know why her husband was sacked from his job? As for Norah, what happened with her family? And then Khady, did she ever make it to France? This is definitely not a happy novel, but one thing that struck me while reading it is that in spite of these women's struggles, their strength comes from them just trying to survive their individual battles. thanks for the review. I"m going to add this to my reading list.